Click here to view a clip! The song lyrics to this Afghani dance express a sense of longing. While the girl must remain home behind closed doors, her beloved is free to roam the world. The dancers of the region of what is today Uzbekistan were once so admired that the Chinese Emperor brought them to his court. This admired dance tradition revived in the 20th century with the founding of the celebrated Bakhor Ensemble. A classic piece from their repertoire, this dance combines lyricism with the technically demanding spins for which Uzbek dance is famous. In Kurdish, ''larzan'' means ''to shake or tremble.'' 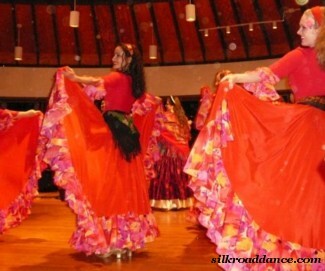 This festive line dance is based on traditional Kurdish folk dance steps. The fiery energy of this piece melts the snows of Winter. Munojat is a prayer, a lament to God. It is also the title of poem by the 15th century poet, Alisher Navoi. The dance itself, set to classical Uzbek music, can be interpreted on two levels. One is the story of a young woman who is forbidden to marry the man she loves. She prays for deliverance form this situation and, in her despair, hallucinates, thinking she sees her beloved before her. She dances joyously only to realize that the apparition is an illusion. On a spiritual plane, Munadzhat is an allegory symbolizing the soul’s yearning for union with the Divine. The women of Rajasthan perform Ghoomar dance on any joyous occasion, to celebrate life stages and yearly festivals. Traditionally when a new bride enters her husband's family home, she dances with the women of the family to celebrate her new status as a wife. Distinctive and dramatic, the energetic dances of Silk Road Dance Company's Russian ''Gypsy'' Romani Suite come from field research as well as work with Drago Russian Gypsy Ensemble of St. Petersburg, Russia. This piece features the elegant, regal poses which typify classical Uzbek dance. The music is a setting for Farsi poetry by Zebunnisa, a grand-daughter of Tamerlane, and is performed by Zuleikho Baikhonova. This dance was gifted to the Silk Road Dance Company by People's Artist of Uzbekistan, Kizlarkhon Dustmukhamedova, who is the Artistic Director of Ensemble Munojat. 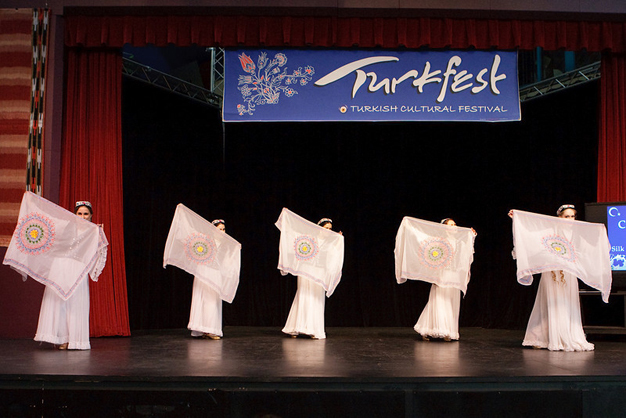 This dance is part of the repertoire of the Turkmenistan Ensemble and was taught to Silk Road Dance Company member Sarah Solomon while in Ashqabad. The Turkmen people maintain a proud nomadic heritage and a superior reputation as horse breeders and artisans. Their carpets, metalwork, and embroidered garments have long been prized by collectors world-wide. Here two groups of girls meet and show off their weaving skills, lovely long braids, and glittering jewelry; many of the dance movements are drawn from daily gestures of nomadic life, including playing music, weaving, spinning yarn, and weaving. This piece embodies the vigor and delicacy of Uyghur dance. The Uyghurs are a Turkic people with a rich, ancient culture; they were a force to be reckoned with in the days of the ancient Silk Road. Uyghurs are currently found throughout Western China, Mongolia, and Central Asia. Wang Yen De, the Chinese ambassador in the Karakhoja Uyghur Kingdom in 981-984, praised their civilization and the beauty of their arts, crafts, and architecture. A modern classic in the Uzbek dance repertoire, Guldasta means ''a bouquet of flowers.'' It typifies the demanding Bukharan style with acrobatic elements and dazzling spins. This choreography is part of Silk Road Dance Company's Legacy Repertoire. 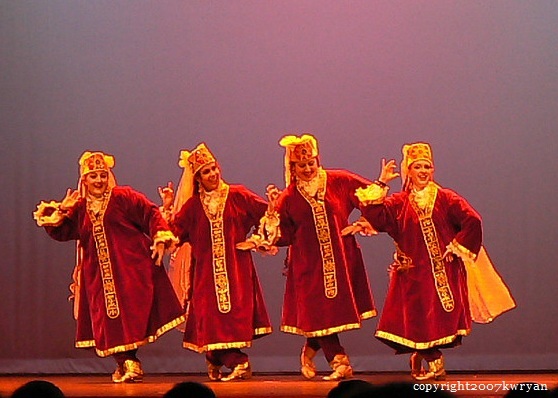 Set in the energetic Khorezm style, this Uzbek dance has a mischievous flavor. Dancers wear bells on their wrists to accent the precise movements of the hands. Choreography taught to SRDC by People's Artist of Uzbekistan, Qizlarhon Dusmuhamedova. This famous classical dance of Samarkand was included in the repertoire of the legendary Bakhor Ensemble of Uzbekistan. It is performed solely to complex dance rhythms. Katta Oyin means “grand dance.” This choreography is part of Silk Road Dance Company's Legacy Repertoire. This historic and charming piece, performed to the rhythm of the Uzbek frame drum (doire), depicts the work of women who create silk. First, they feed the silkworms tender mulberry leaves. Later they spin thread, weave fabric, and embroider scarves.